Looking for something fun and active to do with your kids? 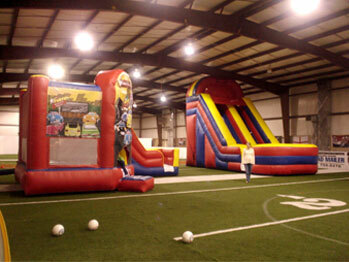 Quantum Sports Center Fun Zone Indoor Inflatable Playground is ready to help your kids burn off tons of energy! Kids of all ages have a blast running, jumping, and literally bouncing off the walls. The Fun Zone is great for Drop-In Playtime, Parties, Camps, Youth Events, Lock-Ins, School Breaks, Field Trips and more! Inflatables are included in our price. Book your party soon as time slots are filling up quickly. The Fun Zone is also open weekends as a Drop-In during birthday parties. Hours may vary without prior notification, so call Quantum to verify times of operation at (304) 562-1020. Hurricane/Kanawha City: $7 per child for members and $9 per child for non-members plus tax. Parents play for free with child. Children under 12 months are also admitted for free. Field Trip Cost: $4.00 per child. Minimum of 30 children. Please Note: Parties and drop-ins may participate at the same time in the Fun Zone during Fun Zone hours of operation. If you would like us to start a class at an outside location or at one of our facilities, contact us by calling or email info@quantumsportscenter.com.